Extended Family also works with Discount Chooser as a "package builder". See package discounting and promotion for more details. Current Version: 1.4. Occasionally, new features are documented prior to being publicly available; please check the version history to ensure the feature you want is available in your version. Support Thread: My commercial software is not supported on the Zen Cart forum. Please email me questions instead. Would you like to ask me questions before buying? I'm happy to help likely purchasers make the right decision. Just use my contact form. Pre-purchase questions? No problem! Just click here. Configuration: Configuration of Extended Family is done by the built-in admin panel. 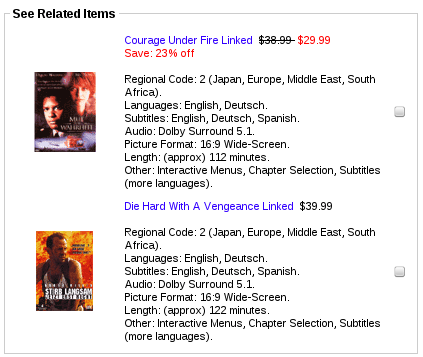 Add-Ons: Extended Family is even more powerful when used in conjunction with Discount Chooser to build product pages. See package discounting and promotion for more details. For example, the configuration below shows that if you display either product 8 or product 19, you should show products 16 and 12 as cross sells. 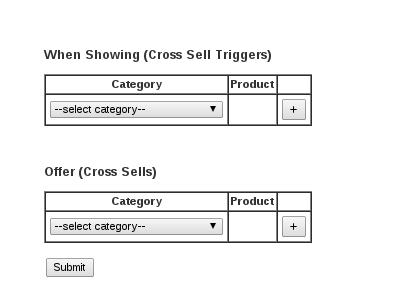 The page is broken into two areas: on the top, a list of existing cross sells, and on the bottom, a form to allow you to add new cross sells. Here are what a group of cross sells look like. Cross sells are listed in reverse chronological order. Cross sells can currently be deleted or deactivated but not edited directly. The cross sells which are currently inactive are shown in red. On the catalog side, now that we have created a cross sell for products 8 and 19 to show products 16 and 12, if you go to the product info page for product 8, you will now see a centerbox offering the two cross sold items. 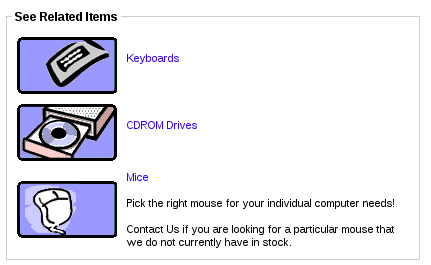 The item must not not disabled (out of stock or otherwise). The item must not have non-defaultable attributes. An easy way to test this is to search for the item, and ensure the search results page shows the item with "Add to Cart" functionality and not a "More Info..." link). 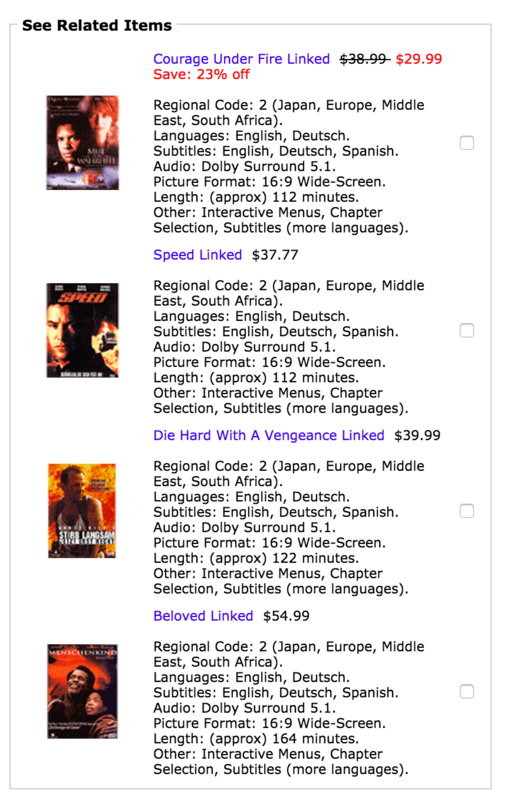 Categories and products with attributes are still shown on the Related Items list, just without the checkbox. Note that since these are all categories, no checkbox appears. The list of related items on the product info page is randomized by default, but can be sorted by product specific fields, (alphabetically by name, by price low to high, or by price high to low) or category id if desired. If you install Zen Cart Common XSell Sort Order , you may also sort by a special purpose field (common_sort) added to the products table. and here's the same list sorted by price low to high. If you install Zen Cart Common XSell Sort Order , you may also sort by a special purpose field added to the products table. Look for the call to zen_draw_checkbox_field. Some stores might only want this behavior for "kit" or "bundle" type products. Here's how to set this flag if the product name contains "Kit" or "Bundle". If you're building packages, Discount Chooser becomes even more powerful when used in conjunction with Extended Family. The retail on these items is $219.98, but you'll sell the package for $199. If Extended Family is installed, an extra button labelled "Family" will appear when the Free Gift offer is shown. Pressing this button will create corresponding entries in the Extended Family tables. 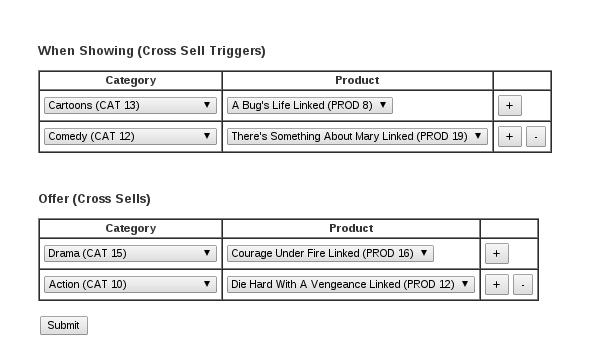 You will now be able to show something even more powerful on the product info page - a detailed cross sell list. Clicking the "Select all" checkbox means all the products will be added to the cart when the main product is added to the cart. There is only one rule for applying discounts for packages (Package Final Price or Package Percent Off) which is different from other discounts in Discount Chooser: all items in the package must be present. 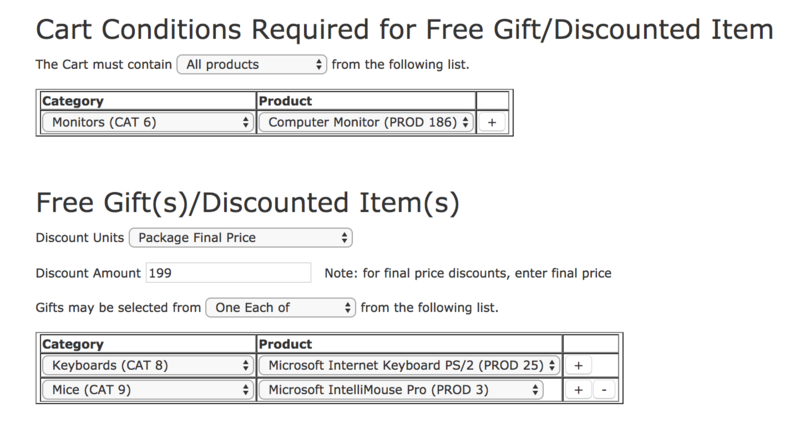 So in the case above, if a customer had only the Monitor and the keyboard in their cart, they would not be eligible for a package discount until the mouse was added. Here's a video showing all of this put together. Copy the contents of this unzipped file to the root directory of your shop. NOTE that these files assume your template name is "custom," so any file with "custom" in its name will need to be renamed if you are using a different template name. Run the extfamily.sql file against your database, using Admin->Tools->Install SQL Patches. Note: If you are using the 1.5.5 responsive_classic template, positioning this change below the Product description looks better. Extended Family may now be configured under Admin->Tools. Unfamiliarity with installing mods. Please review my Guide to Mod Installation on Zen Cart. A misunderstanding of "category." 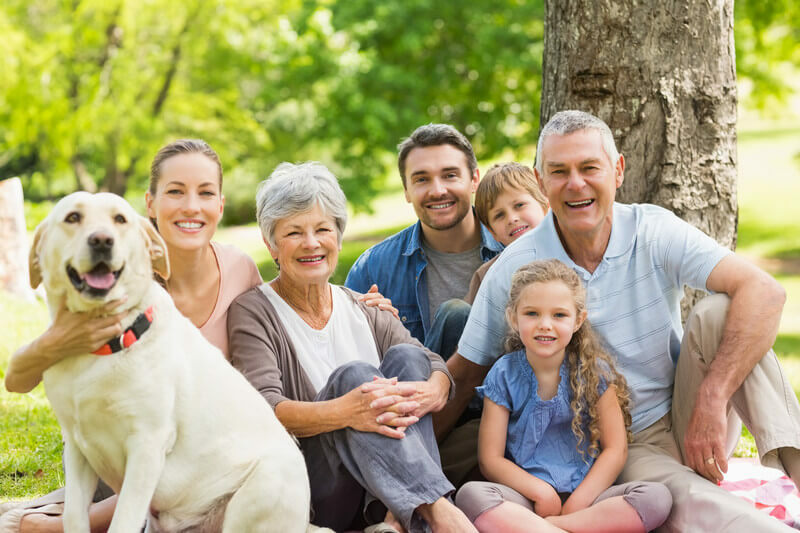 A category in Extended Family is "the master category of the product, and all ancestors of that category" OR "a linked category for the product." See the Category Issues page for a discussion of the treatment of categories in my mods. when running Extended Family Admin if this is the case with your host. Simply set the permissions of admin/extended_family.php and admin/extended_family_backend.php to 644 using your FTP client (or perhaps your cPanel File Manager). this means you ran the sql script in phpMyAdmin without adding the prefix manually. You can avoid this problem by running SQL scripts in Admin->Tools->Install SQL Patches. If you are granting access to Extended Family to a non-superuser in Zen Cart 1.5.x, you must make a change to a core file. In admin/includes/init_includes/init_admin_auth.php, add FILENAME_EXTENDED_FAMILY_BACKEND to the list of files checked on line 49. If you are pulling in jQuery and/or jQueryUI already in your admin panel, you will need to comment out the require statements that do that in ./admin/extended_family.php. If you are running 1.3.9 or prior with the Admin Profiles contribution, there are a few more steps. you must install the software, then go to Admin->Tools->Admin Settings, and check 'Extended Family' under the tools menu. Then go to Admin->Tools->Extended Family, and you'll get an error message in the form where cross sells are entered. Go back to Admin->Tools->Admin Settings, and check 'Extended Family backend'. Now Admin->Tools->Extended Family will work. The "Select all" checkbox in the related items block depends on jQuery. Most templates already have jQuery built in (and recent versions of Zen Cart include it too) so for most stores this shouldn't be a problem. If you are having trouble installing this module, you should also refer to my Guide to Mod Installation on Zen Cart. I'm also happy to install most of my mods for a fee. 1.4 08/01/2017 - Add "select all" checkbox on product info page. 1.2 09/01/2016 - Updates for Common Cross Sell Sort Order. 1.1 08/01/2016 - Updates for Default Attribute. Prior to version 1.2, there was a bug in setting the sort under Admin->Configuration->Extended Family. To fix this, run fix_1.1.sql (in the installation package) from Admin->Tools->Install SQL Patches. Q: Why do Linked Categories only work in Extended Family? A: The definition of a "category" in Extended Family is different from all other mods (such as Table Cross sells, Big Chooser and so forth). It is "the master category of a product, and all that category's ancestors" AND "a linked category for the product." See the Category Issues page for a discussion of the treatment of categories in my mods. 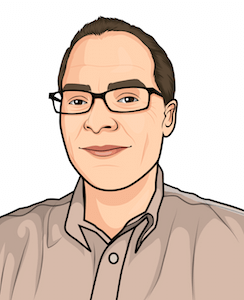 Q: What do you mean by "defaultable attributes" or "single valued defaultable attributes?" A: The two terms mean the same thing. 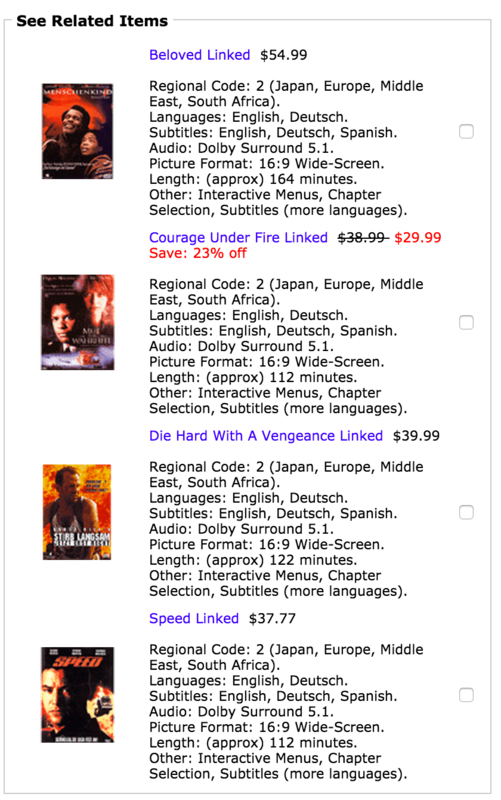 They're just attributes for which a default value can be selected without needing input from the product info page. "Single valued" means the attribute has just one value. For example, a radio button with just one value (such as "PDF" or "ZIP file") is single valued. A radio button with two values (such as "red" or "green") would not be single valued. Similarly, "defaultable" means the single value can be easily set without needing additional input. For example, product with a single TEXT attribute would be single valued but not defaultable, since it's not known what the correct value would be. Similarly, a product requiring a file upload would not be defaultable. Note that in order to take advantage of defaultable attributes, you need my Default Attribute contribution. Q: Why is it called Extended Family? A: Because it shows related products! Q: I want the Extended Family checkboxes on the product info page to all be checked. What changes are required? A: Here are instructions on how to make the Extended Family checkboxes checked by default. Q: What's the difference between Extended Family, Kitbuilder, Checkbox Cross Sell and Impulse Buy? A: They are all bundle-building plugins for Zen Cart, but they each do different things. Kitbuilder uses the product info page like Extended Family, but the products in a kit are fixed and cannot be deleted individually by a customer. 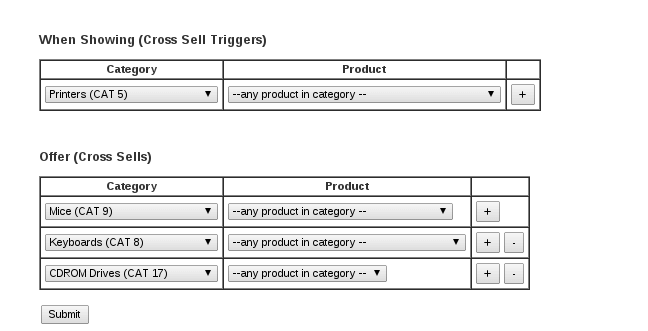 Also, Extended Family allows you to cross sell categories or products with attributes, whereas Kitbuilder does not. Checkbox Cross Sell uses the Better Together configuration to determine what should be shown - either the original configuration in PHP in Better Together, or the Better Together Admin Panel configuration. Impulse Buy appears only on the checkout shipping page and has its own configuration, which is hardcoded in PHP, whereas Extended Family has its own admin panel. I charge a fee of $25 for the Extended Family. Buy Extended Family. The fee covers software only; installation is extra if you require help.